Olda is a Nord lumberjack living in Dragon Bridge with her husband, Horgeir, who runs the local lumber mill. She claims Horgeir is an alcoholic and "drinks away all his money", leaving them "penniless". She is also vocally against the increased Imperial military presence in Dragon Bridge, fearing that they will confiscate the mill "in the name of their war effort". 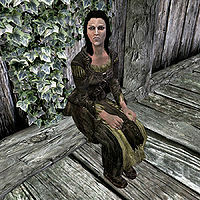 If you speak with Faida at the Four Shields Tavern, she'll comment on Horgeir and Olda's relationship: "Poor Horgeir. Everyone in town knows about his wife's affair but him. Probably better if he doesn't know." Indeed, according to Clinton Lylvieve, Olda is much more interested in her brother-in-law Lodvar than she is in Horgeir. Olda wears randomly determined farm clothes (7 variations) or a belted tunic, a pair of boots (4 variations), with a 50% chance for a hat (3 variations). She is equipped with an iron dagger and carries a key to her husband's house. Dragon's Breath Mead: Retrieve the Dragon's Breath Mead and give it to either Olda or Horgeir. There is a chance that she is wearing no clothes at all except for boots and the standard Skyrim underwear. This page was last modified on 28 January 2014, at 21:03.